Enter to win two pairs of jeans from Los Angeles based premium denim brand Gridlock Denim. 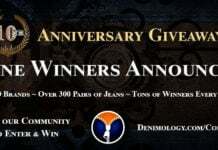 One winner will receive the opportunity to select two pair of jeans of their choice from either the men’s or women’s collections from Gridlock. Gridlock jeans feature back pockets that can be removed and replaced in a matter of seconds. The jeans include more than 20 pocket designs to showcase every season from leather dye cuts pockets to a variety of custom skins. To enter this giveaway either submit your email address using the form below or Tweet this post by clicking on the Tweet button below. Please note that by entering this competition you are agreeing to receive email newsletters from both Denimology and Gridlock Denim. Only one entry per email address will be accepted and the closing date for entries is April 31st, 2011.